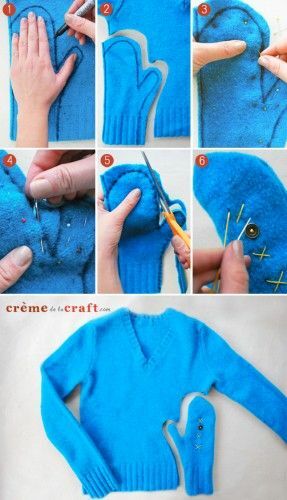 This step by step tutorial of how to make mittens from a sweater in minutes project is a great way to repurpose an old sweater that otherwise would have found it way into a donation box. It never seems like we can find all of our winter gear when we need the following season. We’re always missing something to keep us from having the protection we need from the elements. The worst culprit is our mittens and gloves. Why this happens each year, we’ll never figure it out. So what can we do to keep our hands warm during those cold winter days without worrying about breaking our budget and having enough to last the whole winter long for both hands? Is it even possible in finding some cute mittens that aren’t overly expensive, look cute, and will serve their purpose? Well, yes, there is. All we have to do is look in our closets to find the main materials we need to make our own mittens that will not only serve their purpose, but look so adorable that we’ll want to make a ton of them. If you have some old wool sweaters in your closet that are just collecting dust, then you have the base of your new mittens. All you’ll need to complete your project is some scissors, thread, a marker, sewing pins and needle, and some buttons for an extra touch. As you read the easy instructions below, you’ll have your new pair of really cute mittens made up in less than 30 minutes. You’ll probably be looking for any excuse to wear them as well even if the weather is still warm and sunny outside. But then, who could blame you?